Mix together cream cheese and thyme in small bowl. Refrigerate until ready to serve. Heat Presto® 11- or 12-inch Electric Skillet at 300°. Add walnuts; heat until toasted, about 8 to 10 minutes, stirring occasionally. Remove and reserve. Brush both sides of each slice of bread with olive oil. Toast in skillet at 300° until golden on each side, 3 to 4 minutes per side. Reserve. Wipe any crumbs from skillet. Heat olive oil in skillet. Add onions and salt; sauté until they begin to brown, about 15 minutes, stirring frequently. Reduce heat to 275°. Add cranberries; cook until onions are sweet and cranberries are softened, about 15 to 20 minutes. If skillet gets too dry, add 1 tablespoon water. Stir in walnuts. Remove and cool slightly or completely. Spread cream cheese equally among toasted bread slices. 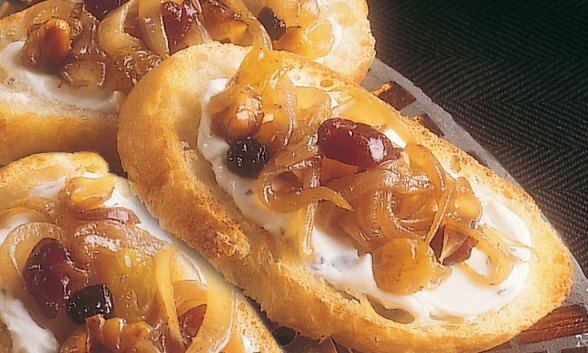 Top with onion-cranberry mixture.